The genesis of what follows was an article that I submitted to a magazine which was rejected. I reworked the article, but rather than resubmit it, I got the idea to build an e-book around it. So this will become chapter 3 of an upcoming e-book tentatively entitled "Electronic Projects for Model Railroads Cookbook". Other than an outline, the details of what the e-book will look like and it's release date are still to be determined. In the meantime enjoy this preview. O Scale locomotives can really eat up the amps. Dual motors, large consists, and open frame series-wound motors, it all adds up quickly; and that’s before you add long strings of lighted passenger cars! You need power, and lots of it. There are good, high output powers supplies available but they all share a common characteristic – high cost. Would you like to get upwards of 20 amps of clean 12 VDC current for little or no money? 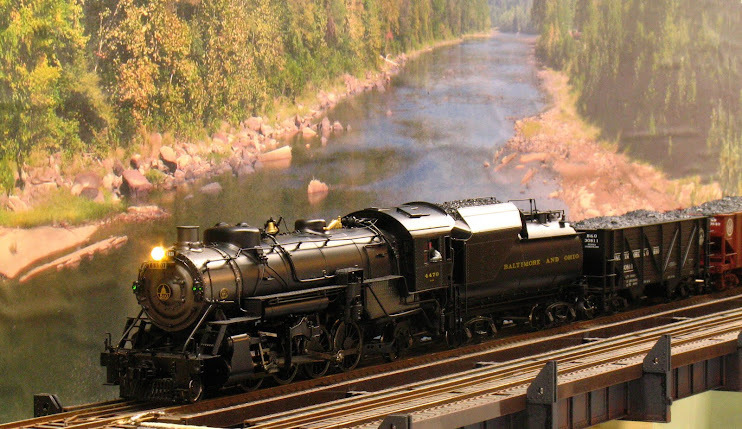 The power supplies from discarded IBM-compatible Personal Computers (PC) can be readily converted to supply pure, filtered, regulated DC to your model railroad. Once you have that power available, you can use it to run trains, throw switch machines, light structures, etc. Anyone with average mechanical and electrical skills can do this conversion – if you know how to use a multi-meter, you can complete this project! The power supplies found in PCs are known by an array of designations: XT, AT, ATX, WTX, and so on; and come in a variety of sizes (see Photo 1). While all of this is standard fare for your neighborhood computer geek, there are only two characteristics that we will need to know to start our conversion. The first is how much DC power can we extract for our railroad? PC power supplies are rated by the total number of watts that they can deliver; anything from 65 watts to over 1000 watts. However, all of that power is not available as any single voltage, it’s distributed among all of the voltages produced by the supply such as +3.3V, +5V and +12V. Why this is important will become clear shortly. 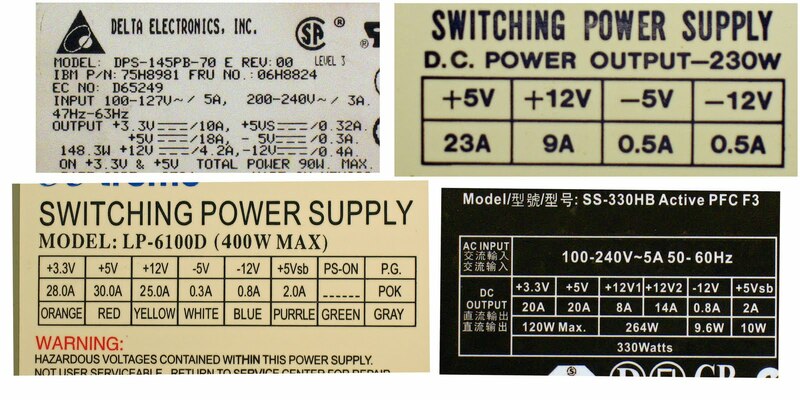 Photo 2 shows the labels from the four units in Photo 1; with ratings between 90 watts and 400 watts, their output ranges from 4.2 amps to as much as 30 amps of the three main voltage outputs. 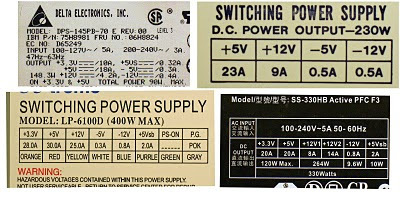 Notice that the label in the lower left of Photo 2 also contains the wire color code for the various voltages; keep this handy to refer to. If you need +12V to run a conventional DC layout, then the +12V output will be of the most interest to you. However, +5 VDC can be used to power servo motor switch machines and +3.3 VDC can be used for layout lighting with LEDs. 12 VDC (or +12 VDC & -12VDC) can be used to run Tortoise slow-motion switch machines. However, most DCC systems will not run on 12V but require more, with 15V being the usual minimum. Unfortunately, you cannot connect the +3V or +5V in series with the +12V to get a higher voltage, the design of these power supplies is such that all of the grounds are common to every voltage and connecting any + to any – will result in a dead short. Nor can you connect the outputs of two separate supplies in series to get a higher voltage. Most of these switching supplies are designed with the output ground common with the 115V mains ground, creating a sneak path through the wall socket that creates a short if two supplies are connected in series. What else do we need to know before we hunt down some used PCs for their ‘ivory’ (i.e. their power supplies)? You’ll need to know what generation of PC supply that you’ve salvaged. This is important to getting the supply to turn on. 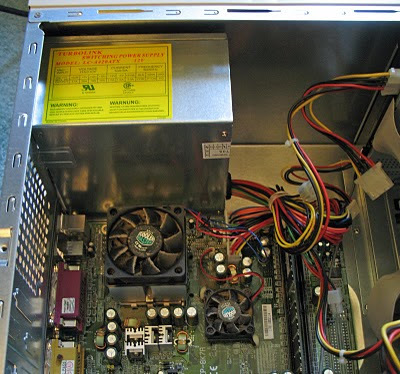 You can tell the generation by the type of connector that attaches the power supply to the main board (motherboard) of the donor computer. Photo 3 shows the connectors used in the first few generations of PCs. A power supply with these connectors will look like the large supply in the center of Photo 1. These units are also characterized by a large on-off switch on the side. Early supplies like this are turned on with this switch, unlike subsequent generations of supplies, as we will discuss later. Photo 4 shows the motherboard connector used in the next generation of PC supplies. These use a 20 pin motherboard connector. These supplies are smaller, like the gray unit on the upper right in Photo 1, and, generally, produce more power. Photo 5 shows the latest generation of connector. It has four additional pins, including an additional 12V circuit; otherwise it’s like the one in Photo 4. If your motherboard connector does not match anything in photos 3-5, you probably have a non-standard, proprietary power supply. I'd bet that this supply came from a computer made by a major manufacturer (Dell, IBM, HP, Compaq, etc.) who probably wants to force the consumer to buy replacement parts from them. These supplies still put out the same major voltages (+3.3V, +5V and +12V) but they may do it on different pins or using a non-standard color code. If you are lucky, the label will have information that will enable you to figure this out; most likely not, however. If you are handy with a multimeter and using the instructions here as clues, you may be able to figure it out for yourself. Otherwise, find a different used power supply. Step 1: Find a used PC. You may already have an unwanted PC or two; but if you don’t, many municipal refuse dumps now have a section where PCs and other electronics are ‘recycled’ to prevent the lead in their solder from winding up in the dump. If your town lets you pick over the pile, you’ll have your choice. A tip here is that name-brand PCs (e.g. Dell, IBM, HP, and Compaq) will have quieter fans; but these manufacturers are so cost conscious that they often have power supplies tailored to the exact model of computer they will be built into, supplying only the minimal power needed to run those machines. And they may also have proprietary connectors that will not follow the procedure that we will use to rewire the supply (Compaq was notorious for this). You may also want to avoid the smaller, ‘small form factor’ PCs – small machines typically have underpowered power supplies. Another source of used PCs is garage sales. You can even wait until the sale is over, it’s very likely that an old machine will not sell and will be discarded; nothing is less desirable than a four year old computer. Goodwill and the Salvation Army sometimes have used computers for sale. Do not pay more than $10-15 for a used PC as you can often buy new PC power supplies on sale for $15. Step 2: Identify and extract the power supply. PC cases come in too many configurations to describe here, but “desktop” and “tower” cases are common variants. Most will have some hex-headed, Phillips screws around the periphery of the back that, once withdrawn, will allow you to remove the top. Some ‘tower’ cases have a single removable side. 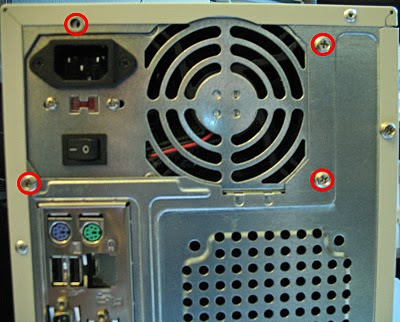 Remove the top (or side), and the power supply will be against the back wall of the case (Photo 6). Look at the label on the supply if it’s visible. If the capacity of the supply is low (say, less than 5 amps on 12V or 5V) and you obtained the PC for nothing, you may want to consider throwing this ‘small fish’ back and trying again. Next, extract the power supply. The supply will be held in the case by, typically, 4 Phillips screws on the back of the case. These screws will be arranged in an irregular pattern on the back of the supply. 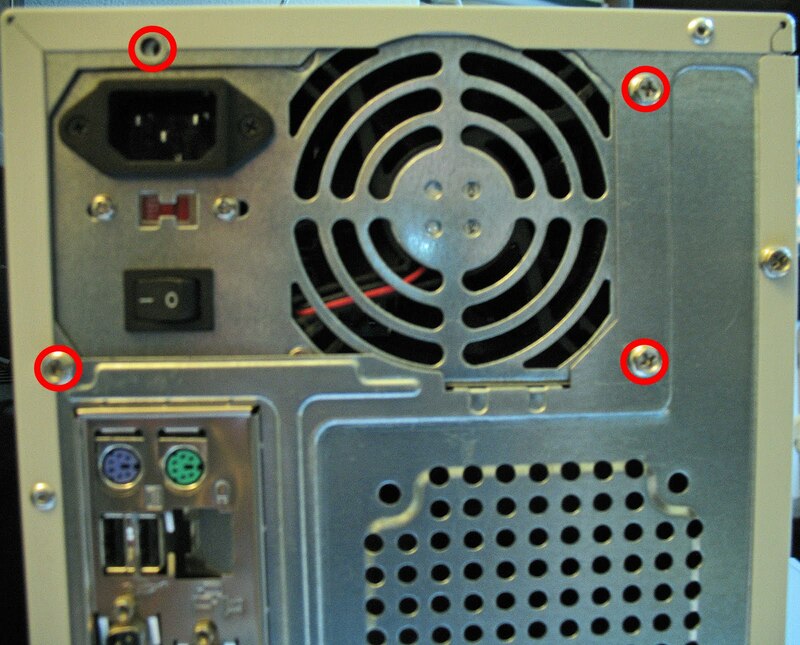 The circled screws in Photo 7 show the most common arrangement. Do not remove the four screws closest to, and arranged in a square, around the fan. Removal of these screws will cause the fan to come loose inside the power supply (Photo 8). If you do withdraw all four of these screws and the fan does come loose, DO NOT go into the power supply case to reattach it. These power supplies generate lethal voltages in excess of the line voltage that can linger long after the supply is turned off. Do not open the case of one of these for any reason. You’ll see this same warning posted on the label of the supply too. Step 3: What power supply do you have? Start detaching all of the power cables that come out of the supply that are attached to the various units within the computer like disk drives, etc. However, save the big connector attached to the large circuit board (motherboard) for last. Photo 9 illustrates a typical installation. Pull this connector and compare it to Photos 3-5. Remember which configuration that you have as it will guide you through the next steps. 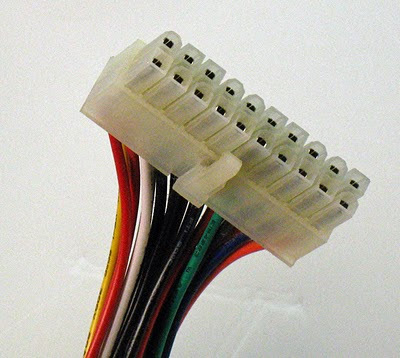 If your main connector(s) do not match one of the configurations above, including the colors of the wires, then you may have a proprietary power supply; you may want to try another donor computer. Step 4: Power up and test. 4a) If your motherboard connectors match Photo 3, plug a computer power cord (i.e. an IEC cord) into the matching receptacle on the back of the supply, plug it into the wall and flip the big switch on the side of the supply. The fan should come on when the switch is turned on. Use a multi-meter to measure the DC voltage between any black (gnd) wire and any red (+5V) wire; record the results. Next measure the voltage between any yellow (+12V) wire and any black wire; record the results. You may want to clip and strip the ends of the black, red and yellow wires to read the voltages. If the black-red voltage is between approximately 4.75 and 5.25 volts and the black-yellow voltage is between approximately 11.4 and 12.6, congratulations! You’re almost done, go to step 6. If the fan does not come on, or the voltages are outside of these ranges then go to step 5. 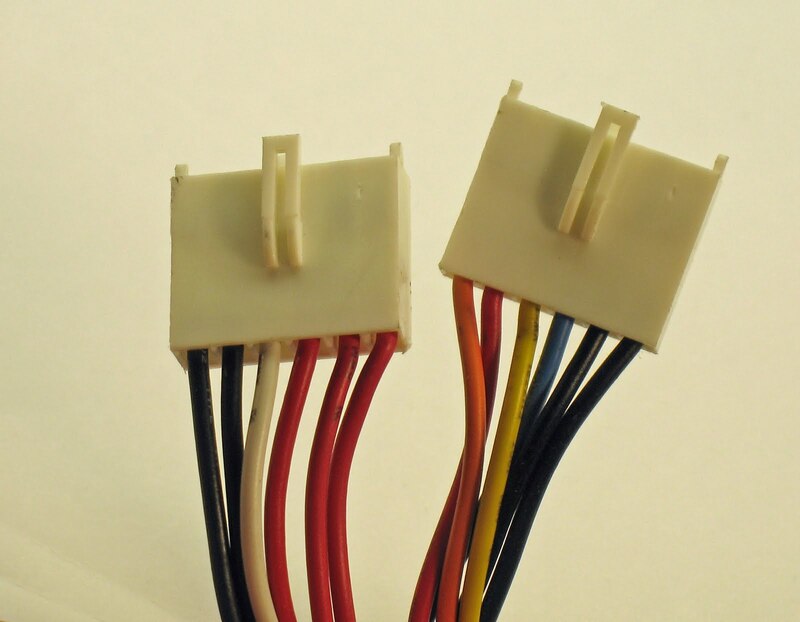 4b) If your motherboard connectors match either Photo 4 or Photo 5, you need to take an additional step to get your power supply to turn on. 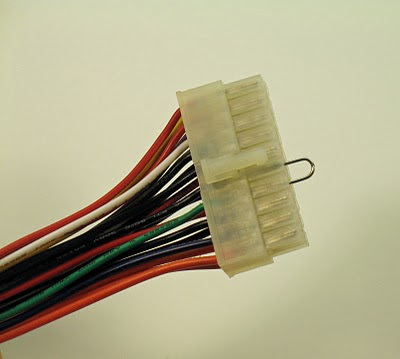 Take a paper clip, break out the small ‘U’ shaped piece in the center and insert it into the connector to short out the green wire and the adjacent black wire (see Photo 10); you may have to shorten one or both legs of the ‘U’ to get it to fit down inside. What you are doing is mimicking the ‘power on’ signal from the motherboard. Repeat the steps above, insert the power cord, etc., but use the small rocker switch on the back to turn on the supply. If the fan does not come on, check the shorting jumper between green and black. If the black-red voltage is between approximately 4.75 and 5.25 volts and the black-yellow voltage is between approximately 11.4 and 12.6, go to step 6; otherwise go to step 5. Step 5: What gives? The fan does not turn on; or I get no voltage; or the voltages are out of range. 5a) If your power supply connector matches Photo 3 and the fan does not turn on, or you get no voltage, recheck all of your connections; make sure that the wall outlet has power; check your multi-meter against a known voltage source (is your meter set to read DC? ); try different black, red and yellow wires; clip and strip the black, red and yellow wires to guarantee good connections to your meter. If you still get no output, it’s very likely that the power supply is dead. 5b) If your power supply connector matches Photo 4 or 5, then do all of the steps above plus recheck the green-black shorting connection. Try shorting the green to any other black wire. Clip and strip the green and black wires and twist them together. If you still get no output, suspect a dead or non-standard supply. 5c) If the fan is on but the voltages are significantly out of range, or there is no voltage output at all, it may be because the supply needs an electrical load to function properly. Without going into a lot of theory (and making your head hurt), unlike the linear power supplies that we usually deal with containing a transformer, rectifier, etc., these ‘switching’ power supplies use the load as part of the regulation circuit and may not produce voltage if there is no load. I would not consider a voltage out of range by a couple of tenths of a volt either high or low as a serious issue. This would be an issue for a computer, but not for a model railroad. But if your voltage is way out of tolerance, you have a couple of choices. Do nothing; your voltage may be a little low (or high), but it may make no difference. This is an option if you have a truly conventional DC operation with rheostats, etc. ; after all, how often do you run at maximum speed? Nor will an over/under voltage condition effect the operation of lights, servos or Tortoise switch machines, so long as the voltage is not grossly out of range. The other alternative is to provide a load in the form of a power resistor. You’ll have to go this route if the supply is producing no voltage whatsoever. A power resistor is not the little dog-bone shaped component that you find in most electronics, but a large, robust, wire wound, ceramic or metal encapsulated device (Photo 11). The power resistor will provide a constant load the moment the supply is turned on and the output voltage should always be present and within tolerance. I have had good results with a 2 ohm, 15 watt or more, resistor (e.g. Allied Electronics stock #895-1334 or #296-4380) soldered between a red and a black wire. Clip a red wire (+5V) and a black wire from one of the disk drive connectors (Photo 12) and solder the resistor between them; insulate the connections. We’re doing this on the +5V line because there’s always more +5V available to waste. Be careful where you mount this resistor as it will get HOT. By putting this in a disk drive line, you’ll have enough wire free to mount the resistor in the airflow of the fan to keep it cool. By the way, the voltage on these power supplies will wander a bit under load, but should stay within or near the voltage ranges given in step 4. Step 6: Getting ready to power the layout. If you’ve gotten here, you have your PC supply working – good job! If you used the paper clip to get your supply to turn on, you have a few choices. Leave the clip in place, secure it and insulate it with electrical tape; or cut the green and black wires and solder together permanently; or attach a SPST switch to the green and black wires. Doing the latter will allow you to mount the switch remotely and use it to turn the power supply on and off. If you are going to be drawing a heavy load on any of the +12V, +5V or +3.3V power. 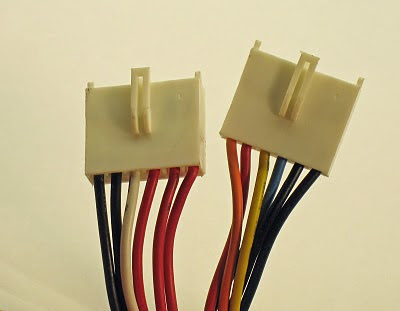 Collect a number of the yellow wires (+12V), red wires (+5V) or orange wires (+3.3V) together from the main connector and the disk drive connectors on the supply so that no single wire is trying to supply the whole load. 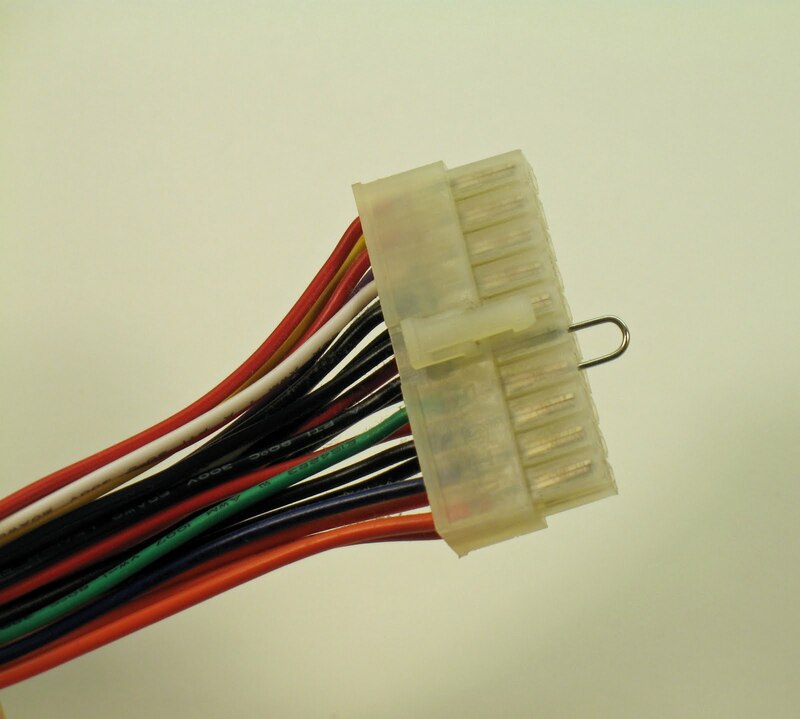 If you have a 24-pin main connector (Photo 5), be sure to use all of the yellow wires from the main connector to get the maximum capacity of +12V. Tie together several black wires to handle the return current. These supplies are capable of providing very heavy currents on +12V +3V and +5V, therefore all circuits attached to these supplies MUST be fused. Finally, if you are using a power resistor to load the supply, mount it to the case, or in the airflow of the fan, or to its own heat sink. Enjoy the luxury of having more power than you will likely need. I really like your helpful blog! I got more idea and inspires more. Also, the emergence of higher-wattage power supplies led to many believing that these systems are better for their computers. Apparently, they misinterpreted that installing a large-containing-wattage power supply would safeguard their computers against under-powering the system, and at the same time, draw only the amount of current required. However, this notion is not advantageous at all, as large power supplies can produce more heat.